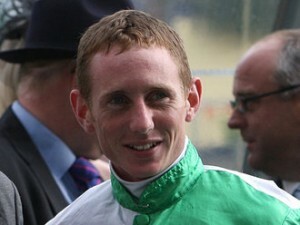 Tom Queally has put his faith in Paul Hanagan in the interesting race for the jockeys' title this year. Though the northern-based jockey was given vague hopes at the beginning of the season of taking the title, but his impressive start continues to gain momentum and he is thus far out in front of the defending champion Ryan Moore. Queally finds it hard to imagine himself battling it out at the peak of the powers in the near future, even though he is enjoying an outstanding campaign so far. "I am on the 49-winner mark for the season so am on course to break the century for the first time and am also seventh in the jockeys' championship, so I'm pleased with my numbers," said Queally. "I'm obviously miles off the pace being set by Paul Hanagan, and there's been a lot of talk and press about whether he can wrest the title from Ryan. "There's a hectic three months to go and Ryan has a lot of firepower to close the gap which is nearly 20 at the moment. "But remember the quality of horses he rides will take him away from Britain, and Paul has shown no signs of letting up. "I think Paul's ridden four four-timers this season and is also weighing in with plenty of doubles and trebles. "I get on with both Ryan and Paul, but it's nice to see the underdog win every now and then and I think Paul is in the box seat." Queally warns that some may not be at the peak of their ability come the autumn, as he believes the physical strain the title race does takes is a large price on jockeys. "Whoever does win it will thoroughly deserve it. The commitment to winning a title is immense and I have seen it eat away at jockeys and burn them out in the past," he said in his racinguk.com column. "I am in my 20's and I don't think anyone at my level is in a position to pick and choose rides. "That said, you'll see some jockeys travelling up and down the country to have one or two rides at a track on horses that don't have an obvious chance. "Come October, they're completely knackered and sometimes not really in a position to do their horses justice. "I don't really think I'll be in a position to challenge for a championship in the years ahead. "If I had a flyer to the start of the season, like Paul did, then I guess you could find yourself in a position to give it a shot. "I think if it happens, it happens, but being dedicated to Henry (Cecil) is my number one priority, so I can't see it happening any time soon."